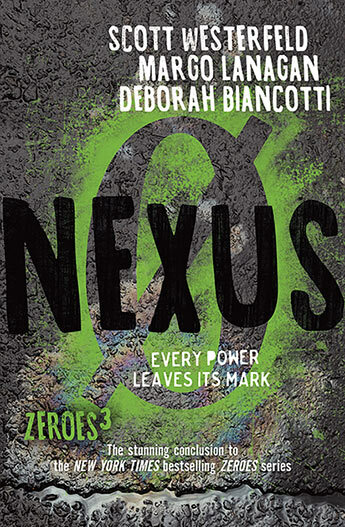 Nexus is the third and final instalment of the Zeroes trilogy which started with Zeroes and continued last year with Swarm. These books go boldly and with some originality into well explored territory – teens dealing with superpowers while also trying to make sense of their lives. At least, the first book did this. The second broadened out the world of the Zeroes, introduced a new menace and moved a little further away from a straight teens-with-powers scenario. Nexus expands this world even further and takes its protagonists out into the wider world. From its opening interrogation in, and rescue from, a supermax prison to a chase on the streets of Las Vegas, to its explosive finale on the streets of New Orleans. It is hard to talk about Nexus without some spoilers for the earlier two books. Suffice it to say that the six main Zeroes are back, in much more straightened circumstances due to the events of Swarm. But despite being on the run and fractured they still feel the need to use their powers for good as much as they can. And when they learn of “something big” going down in New Orleans involving a Zero called Piper they can not resist getting in the middle of it. Nexus has it all – the FBI, a James Bond-style megalomaniac Zero (complete with monologue), almost constant action and cliffhangers galore. But despite all of the frenetic action it also manages to take some time for character growth. Nexus is told with the same verve and energy that drove the first two books as the three authors constantly yet effortlessly switch points of view across the six characters. And it does answer some possibly nagging questions about the Zeroes – where did they come from and why? And while the Zeroes or their world could well be back sometime, Nexus satisfactorily wraps this series up.